Why Aren’t Coalition Forces Planning Raqqa Assault? Which city is more important for the Islamic State, Syria’s Raqqa, the capital of the terror group’s self-styled caliphate, or Iraq’s Mosul, the much bigger city where Abu Bakr al-Baghdadi announced more than two years ago the creation of his caliphate straddling Iraq and Syria? With maybe days to go before Iraqi and Kurdish forces, backed by the United States and other Western allies, launch an assault on Mosul, which will likely take weeks if not months to succeed, Western military officials and independent analysts are cautioning the liberation of Iraq’s second largest city won’t trigger a sudden collapse of the terror group. Its fall would represent a major strategic and symbolic blow to IS, which has already lost a quarter of the territory it once held. Fighters from predominantly Sunni Arab force take part in a training session before the upcoming battle to recapture Mosul in Bashiqa, Oct. 6, 2016. The terror state would survive the loss of Mosul, but not the fall of Raqqa, they say. To speed up the end of the caliphate, some officials and analysts argue a better strategy would have been to attack both cities at the same time, forcing an already stretched group to defend two major offensives on different fronts and limiting its ability to reinforce either. “I think Raqqa is more important to IS than Mosul is, because of how central Raqqa is to the group’s administration of its declining state,” said Daveed Gartenstein-Ross, a senior fellow at the Foundation for Defense of Democracies, a Washington-based research group. Located on the the northeast bank of the Euphrates River, Raqqa, the first provincial capital in either Syria or Iraq the group captured, has even more than Mosul been the administrative center of the caliphate and the city from which terror attacks against Europe are planned. And control of Raqqa and its province has supplied IS with considerable revenue, from the sale of oil from the nearby Al-Habari and Al-Thawra oil fields and from cash the group has demanded from the Assad regime in Damascus for the electric power generated by the Euphrates and Baath dams. Canadian Brigadier-General David Anderson told reporters last week in Irbil that IS values Raqqa more than Mosul. Anderson, who heads a Canadian military mission that is training Iraqi soldiers for the Mosul campaign, is one of several Western military officials who would prefer twin assaults to be mounted simultaneously on Mosul and Raqqa, arguing IS fighters will flee Mosul once the Iraqi city’s fall is imminent only to reinforce the group’s Syrian stronghold, making to harder for Raqqa to be overrun. 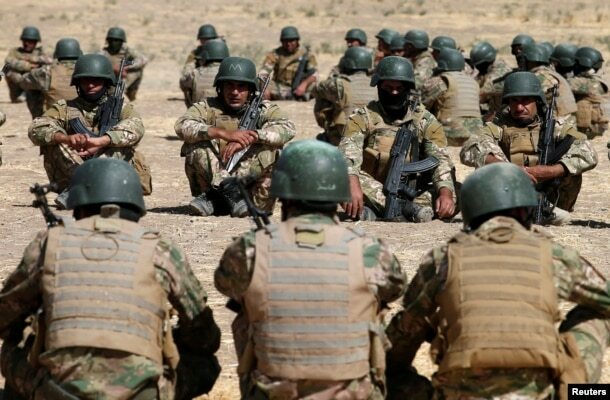 “Mosul’s fall doesn’t mean IS is completely defeated,” Anderson cautioned. “Ideally, both could be pressured at the same time, because I think if I was in Mosul and I needed somewhere to go, I would go to Raqqa, if I wanted to maintain the fight,” he said. Gartenstein-Ross agrees that the best strategy would be to assault both. “It would be a good idea, given how overstretched IS is at present, to attack both at once,” he said. “But doing so depends on having coalition forces that are capable of mounting a serious assault on both of IS’s major cities at the same time,” he added. 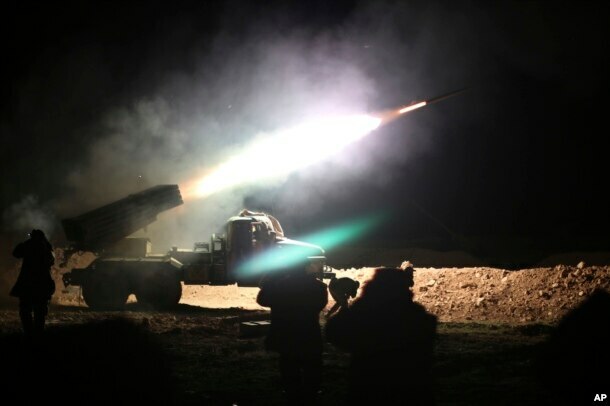 FILE – Soldiers from the Syrian army fire a rocket at Islamic State group positions in the province of Raqqa, Syria, Feb. 17, 2016. Raqqa has come under pressure. President Bashar al-Assad’s forces, backed by Russian air power, have made advances southwest of the city, while a Kurdish-dominated alliance supported by U.S. airstrikes has been attacking from the north. Assad’s forces, however, are now focused on seizing eastern Aleppo from rebel militias. And plans for a full-scale offensive on Raqqa by U.S.-backed forces appear to have been put on hold thanks to a dispute with Turkey, which opposes the Kurds leading an assault on Raqqa, and divisions among IS enemies on the ground. As late as August, U.S. war planners were looking at ways of pulling off coordinated offensives on both cities, which they believed would have had the benefit of pinning down the terror group’s highly mobile units. Now U.S. officials are talking about pressuring Raqqa while Mosul is under assault. 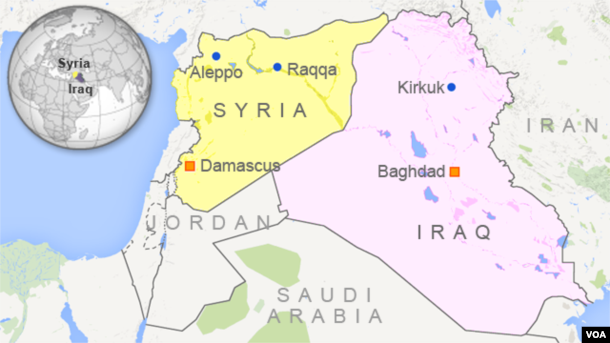 U.S. airstrikes have noticeably decreased in tempo on the outskirts of Raqqa. Washington has been avoiding bombing runs on the center of the city to reduce civilian casualties, with the focus being more Iraq. On Monday, there were no U.S.-led coalition airstrikes in or near Raqqa, according to the Pentagon. When it comes to airstrikes in Syria, the Pentagon’s focus now appears to be hampering IS in eastern Syria close to and along the border with Iraq, disrupting the terror group’s ability to reinforce Mosul, from Deir Ezzor. U.S. officials say they have been monitoring the Syria-Iraq border for months now, building up a detailed picture about how IS moves back and forth across the border.